Toyota will unveil a new fuel cell concept at the upcoming Tokyo Motor Show. Called the FCV, Toyota’s new concept is the clearest hint at what its fuel cell production car–due in 2015–might look like. The midsize FCV-R was Toyota’s first hint that it was working on a production hydrogen vehicle, and recent tweaks to the concept clarified Toyota’s direction for the eventual road-going vehicle. The FCV concept due at Tokyo is much closer to Toyota’s current styling language, while retaining an identity of its own. At the front, a large grille design remains, but unlike the FCV-R’s unusual mustache-like details the FCV flanks the center grille with two enormous side grilles. 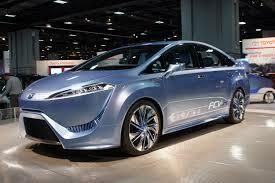 A Prius-like roofline remains but the FCV concept appears glassier than the FCV-R, with a “floating roof” effect. Toyota says the car’s flowing side styling “conveys the air-to-water transformation [in fuel cells] with its flowing-liquid door profile and wave-motif fuel cap”.